Amazon customers love and trust the Dwelling Place Brand! "Seller goes above and beyond to make sure you are satisfied." "Fantastic company providing great customer service and quality products!" - MUST HAVE CONVENIENCE: Grab a fresh cup each morning, pour in your home brewed coffee, snap on a lid and off you go! - PERFECT FOR WEDDINGS & OTHER SPECIAL EVENTS: Our graphic-free sleek design make our cups ideal for special events. Think coffee bars, hot cocoa parties, etc. - INSULATED & DOUBLE WALLED: Our cups will keep your beverages hot and your fingers comfortable. - SAVE MONEY! : Replace your costly coffeeshop visits with your home brewed coffee in our cups. - 3 VERSATILE SIZES: Our cup sizes are comparable to Starbucks Tall (12 oz), Grande (16 oz) and Venti (20 oz). 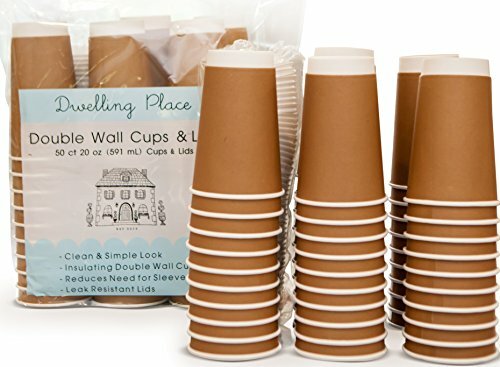 GET YOUR DWELLING PLACE® DISPOSABLE CUPS WITH LIDS TODAY! READY TO GO CONVENIENCE: Our Disposable Coffee Cups won't get left behind, or need washing like your reusable cups. Take a fresh cup each morning for your home brewed coffee, snap on a lid and off you go. PERFECT FOR WEDDINGS, BRIDAL SHOWERS AND OTHER SPECIAL EVENTS: Unlike other cups that have lots of graphics, these look and feel upscale, making it the ideal choice for your special events. Perfect for a coffee bar at a wedding reception or an adorable hot cocoa party for your little ones. Also can be customized with monogram stickers, ribbons or printable bands for a more personalized look. INSULATED & DOUBLE WALLED: These cups feature a thick double wall, eliminating the need for a separate sleeve. The cups are very sturdy and also insulated to keep your beverages hot. The lids provide a tight and reliable fit so you can travel with ease. Pls note: With boiling tea, we recommend double cupping like Starbucks and other coffee shops. SAVE MONEY! : Going to a fancy coffee shop daily can be very costly. Save money by using your coffee maker or keurig or steeping your own tea at home and then, taking it to go with our stylish cups. COMES IN 3 VERSATILE SIZES: Our cup sizes are comparable to Starbucks Tall (12 oz), Grande (16 oz) and Venti (20 oz). Buy the cup size to suit your preference and needs. If you have any questions about this product by Dwelling Place, contact us by completing and submitting the form below. If you are looking for a specif part number, please include it with your message.